So I realized I never posted a picture of Cassandra here. So this is Cassandra during the original timeline. She was one of the Hyperion families spies, and her original cover was that of a dancer, even though class-wise she was a thief. The second was from the rp where I was Shad and Cassandra's son, and this is her older and retired from spying. Here is Cassandra during the current timeline, where she lived on the streets following the fall of the Hyperion family. You may recognize this mug from one of the sprite competitions. When Shad reunited with Cassie, it was to give her away to Leon during their marriage ceremony, something she was spiteful of. The second mug there is her currently, as Shad's spymaster and head spy. And this is an older version of her years later, still married to Leon. At this point, she is still spymaster, but she doesn't go into the field anymore and tries to take on a somewhat more dignified appearance. And this is her and Leon's son, Faust. Faust is Luka's rival and out of that generation of children, probably the most physically imposing of them. Faust's hair isn't actually two-tone like Cassandra's children with Shad, he just dyes it that color to help stand out a bit. Apparently, I forgot to mention this before, but both Luka and Faust are capable of using Dyrnwyn. They often fight over possession of the blade, agreeing to the terms that whoever wins their monthly duels gets use of the blade for that month. And this is Sigrun and Sigurd, Carla's children. I'm thinking that Carla would marry Caius, but I haven't actually decided on that one. Here are some more of the 26th? generation of Hyperions. More of Lowell and Maria's children. They are going to be pretty young, since I'm making them the age they would be to match the others of the generation. This is the second oldest, Rin. She's a bit of a tomboy, and she would be a cavalier. This is Finn. He's a bit of a wild child. At this point in time, he believes himself to be a prince and fashions himself as one. Unlike most of the others in his family, he doesn't fight. He'll go down the route of a scholar like that of his grandmothers family. This is Owen, an often overlooked member of the family. He prefers it though. He'll be trained by Alice and Cassandra the arts of thievery and spying. And last, but not least, Chloe. She's the only one of Maria and Lowell's children to invest serious time into magic. Like her mother, she showed particular skill in it at a young age. This is Taika, a Lycian mage eluding the church. Her partner was a soldier of the Church and hid her away from persecution in the safety of his home. However, on the day he planned to propose, he was struck down by a friend from the Church when his friend discovered Taika was a mage. When she showed up to where her partner wanted to pop the question, she was greeted by his corpse and a soldier of the church planning on killing her and framing her for the friends death. Shad would come along at this time and save her. In exchange, Taika offered to mentor Shad in magic and act as adviser of sorts. Essentially, she becomes Wolfram's replacement as he goes off on his path down becoming the second coming of Nergal. So, I've decided that Illya's mother is named Hadiya. She's going to show up at some point. It's a bit random, but there is a reason I'm bringing it up. Hadiya didn't knock herself up, after all. What started as a little experiment with some mugs turned into Calisto, Illya's father and Hadiya's husband. Leader of his own clan of Sacaen tribesman, he was a very skilled swordsman, despite his poor health. He let Faustus into the tribe due to his relationship with Farrah, but ejected him and their son when word of his ambitions came to his ear. As his health declined, he passed on more and more responsibilities to Hadiya, enabling her own ambitious tendencies to come to the forefront. Calisto, unlike sister-in-law Farrah, is actually currently alive. He is in very poor health and unaware of Illya's expulsion due to Hadiya assuming control of the tribe. Well, I'm impressed by the Calisto mug. It can sometimes be hard to use the more unique looking mugs, but you pulled it off. Yeah, the face itself is Novala, the hooded guy with no eyes, mixed with Carlyle with Innes' nose, then some Rutger and random FE6 bandit. Also, tossed in a barely seen feather as a callback to the feather headpiece Illya wears. It's actually the second time I've made a mug using Novala. Ludwig's mug uses it with Dieck's eyes, Canas' hair, Vigarde's beard and some other bits. Anyway, two more mugs, this time Arthur and Alice's parents. This is Uther Richter, in young and old versions. Still alive, but not in active duty. The older version began as another experiment. When I determined who it was going to be, I made the younger version. And this is Alicia Richter. I made this a while back but forgot to post it. She is also alive and in active duty. She was a officer of the Ostian military pre-emperor, but resigned from her post to raise her children. A devout follower of St. Elimine, she took up a post with a band of missionaries to spread the word. She is strongly anti-Preservation of Sanctity, decrying it as a Ostian-endorsed heresy, a view upheld by her children, despite their positions in the Ostian military. The missionaries she had been accompanying has been aiding refugees traveling through Sacae. Despite her hatred of Ostia's new church, Alicia knows that if war between Bern and Lycia breaks out that she would be duty bound to aid her homeland. Okay....so, this isn't actually a revamp. More of an edit, really. So this is Briar Evangilista Hyperion, the namesake of the Lennox and Illya's future daughter Briar. She is Lennox' mother, Maddox' wife, and Cassandra's mentor in spying. She was a particularly sadistic person when dispatching or interrogating foes, using two tiny needle-like blades to stab into an opponent many times over. Death by a thousand cuts, was what she attempted to do. She retired when Lennox was born, but still passed on knowledge to Cass. She was supposedly killed in the attack with the rest of the family. Urai Zann's right hand is the White Knight, the mentally broken and badly wounded Corin Hyperion. Corin was thought dead by Lennox' hand, but Urai's men saved him from the brink. This wasn't his first go at it either. This is the Black Rose, Urai's eyes in the night. Without the mask, the Black Rose is none other than Briar Evangilista. Just like Corin, Briar isn't all there. She knows of the events that happened to the Hyperion family, but has seemingly repressed all knowledge of her association with them. She was badly wounded by Corin Hyperion trying to save Arron Hyperion. Father Nader, the man responsible for saving Corin years later arrived in time to stop Corin from outright killing her. So here is a...new mug for an old? character. I've been looking through some of my old mugs, seeing what I can update when the idea popped into my head. I really hate how Arthur looks. Just like I thought old Lennox had a derpy face, it just seemed really off to me. Than I saw the mug I made based on the FE version of myself from the whole Corporate FEP thing that Rock drew up. And here we go. This is the mug I made to match it...this is not as old as that, but I made this years ago. And this is it as the new Arthur. First mug is before his days as a General, as Lennox' friend, mentor, and rival. The latter is as he currently is, Ostian General, anti-Church of Preservation, pro-Alice/Shad. He sends Alice out after Shad solely to secure an alliance with him. Arthur is part of the very few people who knows that Shad saved Alice as a little girl, and Arthur is doing his part to try to unite them, and possibly get him to depose Urai Zann. Oh, and I almost forgot this mug. This is a revamp of an old character I made for Dark of Night's Dark Brotherhood. His name is Kendrick [SURNAME NOT FOUND]. In DoN, he was a thief from Tavrica who joined the Brotherhood. He was going to level up into the Tavrican exclusive class that used daggers and bows. In Insurrection, he's another Ostian spy, Alice's superior, who goes rogue to try to track her down and 'collect' her. He has an unhealthy obsession with Alice and specializes in poisons. Roman Hyperion, the youngest heir of Anton Hyperion. The rest of the Hyperions are descended from him out of Anton's heirs. He was physically stronger than the Hyperion who wielded the blade, but was smart enough not to cause conflict between them. Andrei Hyperion, Roman's son. Due to not being the main branch of the family, Andrei ventured off as a mercenary, free from responsibility. He wound up getting killed by the main branch because of the next person in this line-up. Saraya Hyperion, Andrei's sole heir. Her mother accompanied Andrei as part of his mercenary company, the two wed and Saraya was born. Saraya had greater ambitions than just being the mercenary relative of a noble line. I said before that the line that wielded Dyrnwyn after Anton died off because of the sword. While the blade claimed most of them, it was strife over the blade and the noble line that killed the rest. Saraya stole the sword from the current wielder of Dyrnwyn and the head of the family. She demanded that she be made head of the family and a swift battle took place between Saraya and her mercenaries and the Hyperions. Andrei and his wife were captured and killed, and in return 'Sweet' Saraya slaughtered the 'main' line with Dyrnwyn. She took what she thought was hers, and her future husband reluctantly agreed to take on her name. Saraya is the first Hyperion-born woman to wield Dyrnwyn. They wouldn't realize till many years later that any woman could wield it if they could lift it. Although, technically speaking, it hasn't been discovered yet in the rp. Saraya's heir, Dain. He's 'sweeter' than his kinslaying mother. He forged a sword, Dáinsleif, that can't be sheathed until it's claimed a life. He also claimed that the wounds it inflicts never heals, but everyone Dain ever fought he killed. As the bloodlust consumed him over the years, he abdicated to his infant son and traveled the land, slaughtering many people in his wake. The pigment in his right pupil was very low, making it appear that the eye was red. He was also known to wear a smear of blood across his face. He is also rumored to have caused a war due to his actions. Dain is probably one of the most infamous figures of the Hyperion family, due to his unrepentant slaughter. The existence of Dáinsleif is questionable. Dain was buried in the family tomb, but the sword was never recovered. If it exists, it's lost somewhere in Elibe. There are also doubts about Dain being the one to craft it. 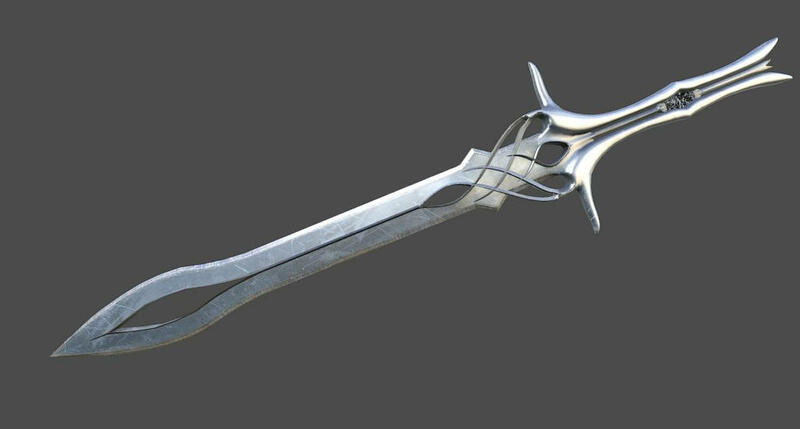 Some believe that the blade could have been yet another weapon made by Francesca to rival the Eight Legendary weapons, considering her record of highly destructive weapons. Lenox Hyperion, the longest 'reigning' head of the Hyperion, having been the head of the family after Dain abdicated to him as a toddler. Lenox unfortunately spent most of his life atoning for the sins of his father. 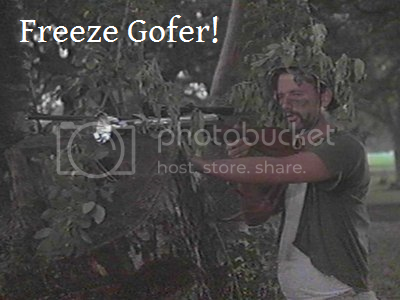 Grier, oldest son of Lenox. One of the wielders of Dyrnwyn. He also spent years of his life atoning for Dain Hyperion. During his life, they stripped the family of their noble rank. It would take two generations and help from the Carons and Fens to raise them back to prominence. Mathis, Griers son, was a mercenary who worked for the nobility, trying to earn their graces once again. Unfortunately for him, he was very blunt and harsh with his words and that did him no favors. Rastus Hyperion, would be the Hyperion to return them back to prominence by putting down an insurrection that threatened the King of Etruria. Thankfully for him, the king never discovered that the Fens and Carons instigated the affair to help the Hyperion family. And finally Finlay Hyperion. He would also wield Dyrnwyn and was the first Hyperion to achieve the rank of Knight General. And with that...four more Hyperions left before every generation between Hildebrand Hyperion and Shad have a representative. After those four Hyperions, it goes to Mason back on page 2. 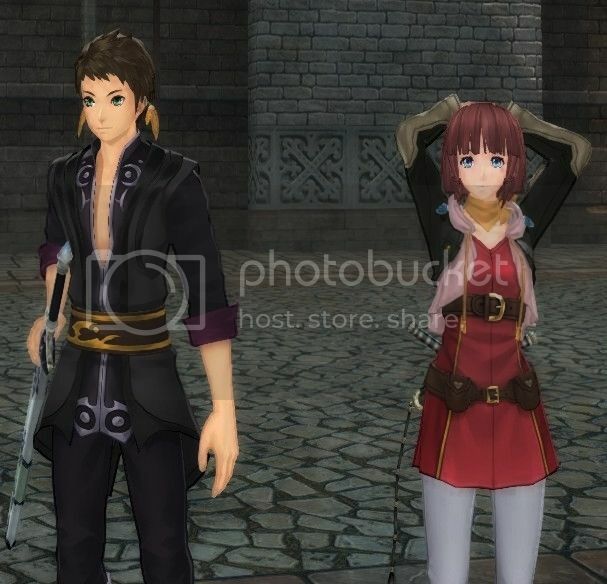 On an unrelated note, been playing more Tales of Zestiria and with some new customization options, Sorey and Rose look even closer to Shad and Alice than they did before.
. . . . . .Boredom! More battle sprites! More detail in the more prominent npcs to be featured. In order from left-to-right. Alice, packing dual dagger on her back, Cassandra and her shortsword, Illya unarmed, Black Rose Briar with her armor on the other side(laziness began to set in), then Calisto(almost no real effort). MORE BOREDOM AND LACK OF SLEEP!!!! White Knight Corin in masked form. Sure, he isn't as built as a 'knight' should be, but to be fair, he is half-Sacaen and had training from Arron, a fencer. Plus it can't be easy to get much exercise with his injuries. On the bright side, he's still pretty fast. And for this next one...I'm going to need some music. I'll elaborate on the choice of music after the next piece. I went and actually made up a battle screen between Corin and Lennox, although Lennox wouldn't exactly be wearing that when this fight occurs. So...yeah, I thought that for the battle between Corin and Lennox that Corin would be a little...crazy, you could say, and prepare a battlefield for them. He would steal Dyrnwyn (and his companions weapons) and hide them amongst a scorched field of almost broken weapons that they would use to fight. Because he's not quite there and is looking for a bit of a thrill. If Lennox has any companions besides Carla and Illya for this fight, he'd have mooks fighting alongside them also using the disposable weapons. Their hit percentages are low because they have high evade ability. And there isn't a stat for blocking/parrying attacks. 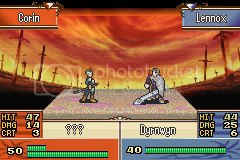 Corin's weapon is a question mark because at this point in the fight, Lennox found Dyrnwyn, but Corin is still using the disposable weapons. So yeah. I wouldn't exactly say that I had just recently got into Fate series. I only really knew some things, Archer's Unlimited Blade Works for instance, but after watching Fate/Kalied Liner Prisma Illya a month or two ago, I kinda found myself listening to the Emiya theme...several remixes of it...and a thought crossed my mind a few dozen times to use them as battle themes for Shad, Lennox, and Maria(haven't figured out how she's getting into a fight at her age yet). On another note, I have a feeling now that I think about it that someone, Merc?, might have made a battle animation on the old forums related to UBW. I'm probably going to go back and look, hoping that it wasn't taken down over the years. Although, now that the though passes my mind again, that might have been one of the few Bleach inspired ones. Either way, going to go look. EDIT: I didn't see it in the few minutes of searching. But the Bleach ones were BwdYeti now that I look. . . . .And now I remember how good a lot of the spriters were on the old board. Another update! This time, Boredom with sleep! 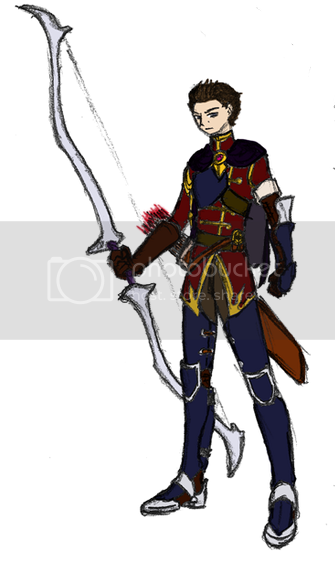 New Lennox Sprite, wielding as close to as I can make for Dyrnwyn's representation. It is based on this image I found. It's very hard to find images of greatswords with white hilts. The outfit is based on his Sacaen garb, with pelt over the shoulder. An updated version of the battle using the new Lennox Sprite. The odds are rather in Lennox's favor(as they should be!) 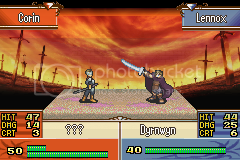 since they both have low HIT, and a couple wacks with Dyrnwyn would finish Corin. Anyway, nice sprite work. The new Lennox one rocks! The cloak/pelt that Lennox is wearing is an update of sorts to one I made for Maddox years ago. I made a sprite of Maddox wearing his 'noble' clothes. From left to right. Taika with her multicolored scarf, thirteen-year old Lowell, an update to an old Carla sprite, Wolfram, and Arthur. . . . . . . . . . . . . . . .I really don't know why I'm suddenly on a battle sprite kick. Maybe because, if I make more mugs...that's more characters to come up with...and I've come to the realization that I'm slowly turning Shad into the protagonist of a harem anime, with Cass, Alice, and Taika all following him. Anyway, here are some new battle sprites, two of them are lazy recolors, and two of them I actually used some effort. Maria's son Owen and savior from off-screen death Father Nader. Okay, so I spliced a new head on Owen, but really no effort. Sweet Saraya with Dyrnwyn. It's partially planted in the ground, in this, since it is as tall as she is. And here is Dain, covered in blood, wielding Dáinsleif. It's design is based off Dáinsleif as shown is Symphogear GX...which I binge watched earlier this week. . . .At least I didn't watch it and make a new companion for Shad or Lennox...like what happened when I watched Rokka of the Six Braves and Anti-Magic Academy: The 35th Test Platoon. Illya was based on Fremy from Rokka(as mentioned before) and Taika was inspired by Nikaido Mari from Anti-Magic Academy.